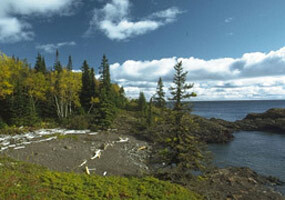 French trappers gave 45-mile-long, nine-mile-wide Isle Royale its regal name. Located north of the surging waters of Lake Superior, most of the approximately 134,000 acres of Isle Royale National Park have been designated Wilderness. The largest island in the largest freshwater lake in North America, it is also by far the state's largest Wilderness area. Created by flowing lava, flattened and smoothed by glaciation and subsequent erosion, the island contains more than 30 lakes; in fact, water covers more of the surface than dry land. In the lakes you may catch northern pike, trout, walleye, and perch without a permit. (Fishing in Lake Superior, however, requires a Michigan license.) Around the lakes and along the shore of the island grows a forest of mixed evergreens and hardwoods. Isle Royale is home to a famously secretive population of timber wolves, which you may hear howling at the moon. Other wildlife includes moose, beavers, red foxes, red squirrels, and snowshoe hares. Approximate 150 bird species have been spotted. Human visitors come to hike, camp, fish, and watch wildlife. With miles of splendid coastline indented by numerous protected bays and sheltered coves, this is considered a marvelous destination for sea kayakers. There are 36 established primitive campgrounds (available on a first-come, first-served basis) set along about 170 miles of trail and/or endless shorelines.